Are The Benefits Of Starflower Oil For Real? Starflower oil is found in the seeds of the starflower plant, which is perhaps more familiarly known as borage. The borage plant is well known for its culinary uses, with the leaves and flowers used as ingredients in salads, side dishes, and pastries. While cultivated in many countries, borage is most often encountered growing wild. Borage is also well known as a medicinal plant. In common with many medicinal plants, many of the beneficial claims originate in folklore. Today, many of the claims, especially with regards to the seeds and oil (starflower oil) are found in the descriptions of, and advertisements for, starflower oil supplements. There isn't necessarily anything bad about that. The medicinal properties of the plant are well known and documented. 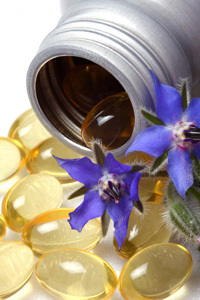 Unfortunately, when it comes to treatment of disease, including some of the more serious diseases such as diabetes and multiple sclerosis, one all to often hears the phrases " is thought to", "is believed to be", and "may help in", when discussing potential benefits of starflower oil supplements in dealing with these diseases. Such statements can be misleading, but can be useful in promoting a given product. In all fairness however, the benefits which may be gained from using starflower oil do appear to have some validity. In the final analysis, you need to be the judge. Linoleic Acid And GLA - At the heart of the matter is a substance called gamma linoleic acid, or GLA. GLA is produced naturally in the body from linoleic acid found most abundantly in safflower, sunflower, and corn oils, and in other foods as well. While most people in good health readily convert linoleic acid to GLA, others, due to various disorders cannot. In addition, there are many processed foods which are rich in saturated fats and trans fats which have a tendency to block the linoleic acid to GLA conversion, leaving us with a deficiency in this important element. Why this is important is because GLA plays a vital role in regulating and modulating the production of many of the hormones used in our immune system to control swelling, manage nervous system and allergic responses, and much more. A lack of GLA can lead to hormone imbalance in some instances. Supplements, such as starflower oil supplements, and evening primrose oil supplements, which provide linoleic acid, can make a difference. Although generally believed to be free of damaging side effects, since hormone balance is affected, starflower oil or evening primrose oil is not advised for women who are pregnant, and people with certain disorders of the nervous system. Evening primrose oil was once the oil of choice as a good source of linoleic acid. Starflower oil has since become the favorite, simply because it is much more potent. Benefits, Proven And Unproven - The list of potential benefits in taking starflower oil, either naturally or as a supplement, is rather lengthy. In some cases, scientific evidence appears to back up the claims made, in other cases things remain unclear, though the supplements are "thought to be helpful". The beneficial effects of GLA on the immune system are well known. For most of us, including borage, or any other food item containing linoleic acid as a regular part of our diet seems to suffice. GLA supplements have been shown to provide relief to rheumatoid arthritis sufferers, as it has been established that GLA plays an important role in helping the immune system's anti inflammatory responses. The benefits of Starflower oil supplements in other cases, such as the treatment of alcoholism, control of cholesterol levels, and treatment of certain skin disorders, vascular disorders, gout, and impotence are much less clear. Summary - Starflower oil does indeed provide some benefits due to the presence of linoleic acid in its seeds. In supplement form, products may or may not live up to some of the various claims made. But aside from the cautions against certain people taking these supplements, they by and large appear to be harmless in terms of any undesirable side effects which could occur.